There is nothing like a Wargaming Convention to get mind and spirit moving and get one excited to get moving on something. OK Not that sort of Middle Age. Its also a good reminder that while I'm not one of the younger gamers out there, I'm not the one of oldest either and there is good reason to anticipate a decade or two more of wargaming to come. Time to get serious about dealling with Wargamer's Middle Age Spread. So, the plan is more expansion and contraction, more of less as it were. The urge to do all the not 'done right yet' things and to plan on doing everything has weakened yet again while the urge to get deeper into a few of the unrealized campaigns has gotten stronger. Between Fall In! and Huzzah!, I've regained my interest in low level engagements and after playing on a bigger table at home and even bigger ones at the conventions, as well as playing on smaller tables, I've also gained an added interest in non-gridded games on smaller surfaces. Here is what I plan to work on over the next six or so months. 1) I'm not really a tricorne fan but I do love the Prince August semi-flats and they are, all in all, if you mix ranges as I do, the most complete range of moulds in 40mm. Its also, unintentionally, become one of my larger figure collections and I'm still adding molds and figures so I want to use it. I can also feel an urgent desire to stop talking about fictional campaigns and do some! So, despite a gulity feeling that I really OUGHT to be doing something historical from Nova Scotia's history, last winter's planned campaign set in the wild coast lands to the North and East of Rosmark is going ahead. Look for wooden forts, wooden ships and wild irregulars in fur caps as well as Rosmark and Duchy regulars, local militia and possibly even foreign allies from the lands beyond the forests, oh, and a map! But, don't look for big pitched battles. This will be a war of skirmishes and small expeditions. Charge! is the set of rules for NQSYW battles but for my private sub campaign I will be spending a lot of effort over the next two months to polish the 20th Anniversary Edition of With MacDuff to the Frontier and plan to use them on this frontier. 2) I have also been itching to do some more Prince Michael games, or something equivalent and to get deeper into that campaign setting but I'm stymied with too many choices of figures in different periods and scales. Again I am cutting some cords. I didn't set out to build an Elastolin Roman army, they just came with other stuff and since I still have a thing for the Eagle of the Ninth and Sword at Sunset as well as Prince Valiant I painted them up, just like I started painting the 25mm Sassinid army I never built in college. In both cases my head isn't really there and they have stalled and stalled me in indecision (guilt is too strong a word) I've had some fun with what I've painted up but it feels like yesterday and I will be making an effort to re-home both of those with any funds being directed back into what is left. I will keep two 25mm DBA/HOTT/Impetus sized Scots and English armies. That will get me back to where I was with the 40mm Five Winds project with Medieval, early and late, Barbarian, and Eastern hordes to work with. The rules will be twitched into a variant of Rough Wooing but I need to work more on rules for characters and the use of single stand units in skirmishes. The latter thought worried me but looking back over the Prince Michael adventures where all figures were singles, I don't see that having the groups of minions on bases would be much different than having them bunched together as units of single based figures, except possibly, when it comes to the occasional photo op. 3) The ACW in 1/72nd. Nothing big here except that this is likely to remain my only full sized horse and musket battle collection and so I can relax and leave the current 3 stand units. It is coming off the grid though and will carry the Hearts of Tin banner now that I've tried the various options to see how they each feel. This'll give the closest feel to an OSW type wargame. I don't actually expect to do much with this lot this year but its place is now known. 4) Now don't panic. All the 19thC Square Brigadier/Portable Wargame figures in various 40mm and 54mm collections aren't suddenly disappearing. Its just that whether or not I get the itch to paint up a few more figures, I can pluck 2 armies and have a game going with about 10 minutes notice so there's nothing that needs to be done right now and I'm not planning any background development or campaigns this year. Saturday morning was to have been a morning for wandering about looking at games, chatting and so on but... one of the HAWKS who was scheduled to run a game Saturday morning had had to cancel so our table was empty in a full venue. 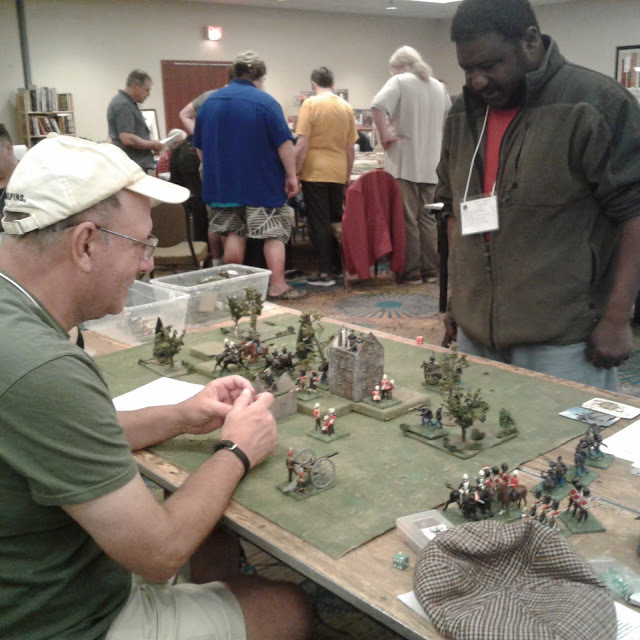 I decided to set up an unscheduled Portable Wargame session and nabbed one of the Sunday signees as well as Rob and gave the Zulus an outing. It seems the Zulu miniatures were unable to pass on any of the experience gained during the play tests and superior technology won out in each round. The last one was close however. 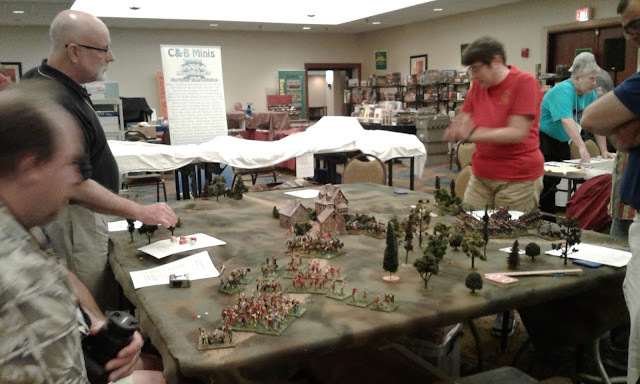 After a quick lunch on the run it was time for some American Old School Wargaming with Joe Linares and George Nafziger's Pas de Charge! from 1977. Joe had gamed with George back in the day and had acquired his collection of Hinton Hunts. Little figures, big battalions and brain exercising arithmetic. The game was based on the battle of Verona/Caldiero but boiled down to fit the table size and time available. Once again there was a good group of gamers on both sides of the table and some tense moments with some failed high probability and successful low probability rolls keeping everyone on their toes. The combat rules involved a little bit of simple arithmatic like (no of figures x (2d10+factors)/200) sort or say (34 muskets * 73) etc. We did a fair amount of rounding and guestimating on the corner of the table I was on but I noticed a few smartphones with calculater apps appearing on the far corner of the table). Despite that the rules were easy to grasp and played quickly. The battle lines are drawn c Turn 3 or 4. Alas these pictures are the best my cellphone could do in that light, the rest were even worse. 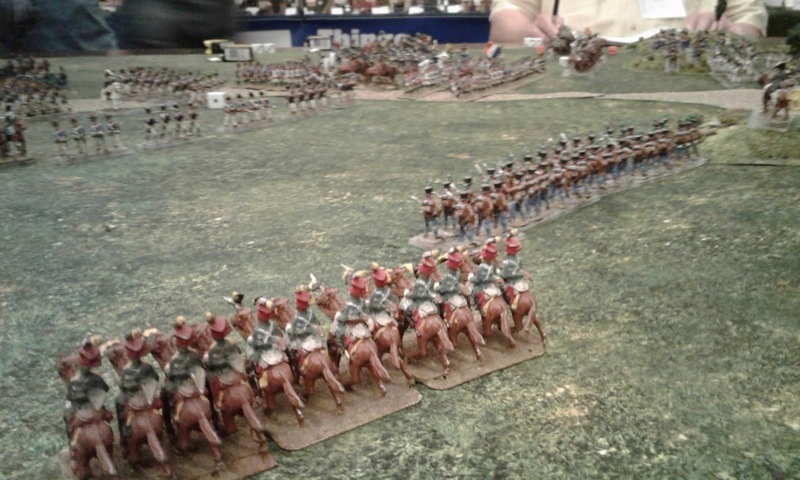 I commanded the Austrian Advance Guard, the only troops on table at the start. 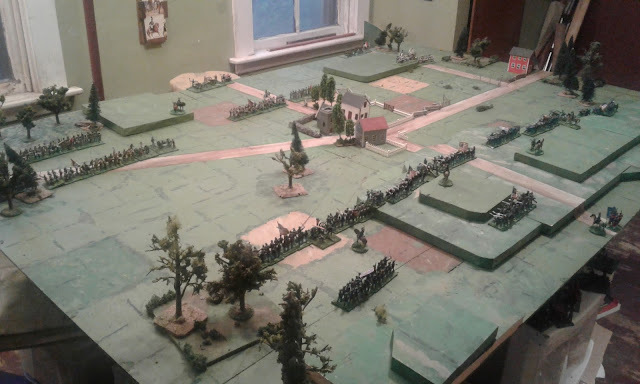 I placed my gun on a small knoll in the middle with infantry on either side and Uhlans guarding my open left. My Uhlans did very well, not running away until the enemy got close. My Grenzers did some what better, trading fire for several turns and not running away until charged by four French battalions. Even then they had the presence of mind to successfully make the narrow chance shot at the enemy General as they ran. The French then failed three fairly easy morale checks one after the other leaving one disordered battalion to charge my lone gun. This gun was my Premiere Etoile of the game. It drew first blood in the game, helped drive back the first French infantry probe, routed an opposing gun as it unlimbered and then with my personal figure at its head, stared calmly at the mob of French infantry rushing uphill at them. 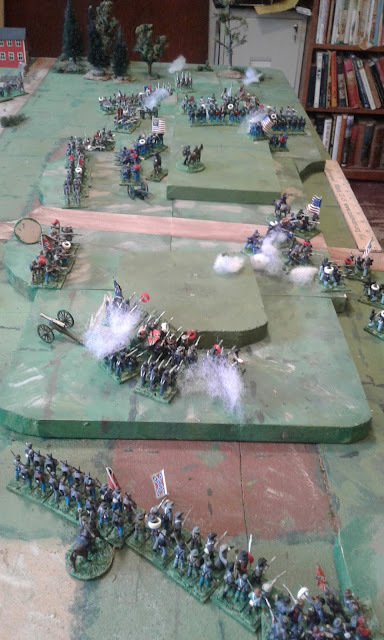 As the crisis approached they passed a difficult morale check and then unleashed the most deadly possible shower of canister into the French attack sending the mob running back down the hill. Since the opposing forces had fought to a messy draw on the far side of the table and time was up, that battery was key at our holding the vital road exit. At least until the French regrouped but that would be another game. Its a pity one can't really take credit for lucky rolling but I will claim some for choosing a solid position and not letting myself be drawn out of it and for not retiring prematurely in the face of seemingly overwhelming odds. Luckily the overall Austrian Commander was one of the better sort who used his reserves well and supported his subordinates. Anyway, I'm not tempted to go back to rules needing constant arithmetic and much counting of noses but I had a good time and it did get me thinking about slightly more tactical detail in low level games. 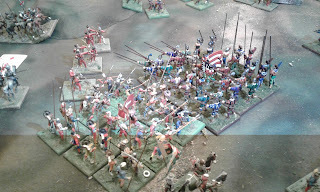 My HOTT army in battle as I stare befuddled and rather bare headed at a ruler trying to remember how many cm=100 paces. Propaganda shot by Rob, stolen from his blog. 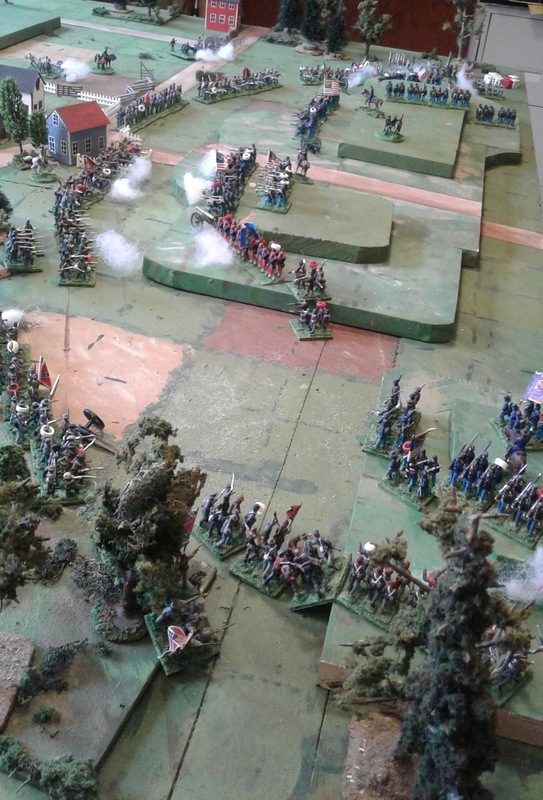 One of Sunday's big events the 25/28mm North West Frontier game. Sunday morning and the last gaming session followed in its time. Already many people had cleared out but the room was by no means empty. I was up early(ish) and had two Portable Wargame tables set up. Eric, another HAWK, loses Hook's Farm to the Americans Blue Army. 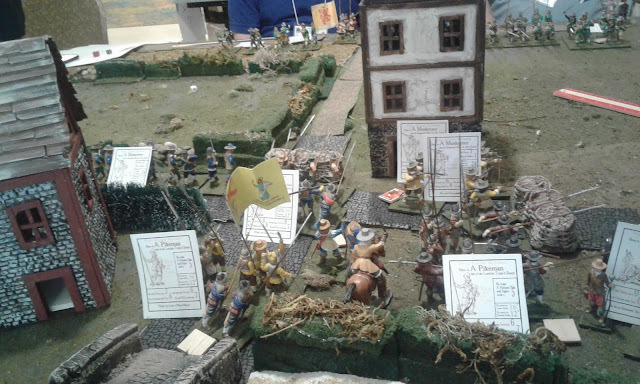 On one table I had the squared cloth and a choice of 54mm armies: Hook's Farm with Red vs Blue or Zulus vs British on the same terrain minus buildings. On the other table I had a 3" gridded Hotz mat with the choice of 1/72nd Russian Civil War or Boer War. Red and White fight over control of a small village. I was too busy briefing players and answering questions to keep records of how many games were played or of any coherent details but I think there were about 7 games played by 6 new players. In every case the players picked up the rules quite simply though it took a few games to start picking up some of the tactical subtleties. Most of the games were fairly evenly fought where both players had equal experience and all were fast. Everyone who played seemed to have enjoyed the game and a few asked about where to get a copy since it seemed to fill a niche for them. The 54's were quite popular with passer's by and with the players. (Only 1 game was played with the 1/72nd setup). Another photo stolen from Rob's blog (see above). For those who excuse off-scale minis please not that while Rob is noticeably taller than me in pictures, his head is roughly the same size. And then it was over, just a long ride back, another short visit with family, a planned tooth extraction a day or so after I got back and so on. In other words, back to real life. Sighhhhh. Its going to be a very busy domestic month ahead but there will be more wargaming blog posts appearing here regardless, just not about Rough Wooing, Zulus or Portable Wargaming, not right away at least. Time to get back to those new Prince August moulds I think and possibly some skirmish-y games. ........not on rapid batch painting of two dozen 25mm Pathan's. The basic colours were laid in but time was running out! 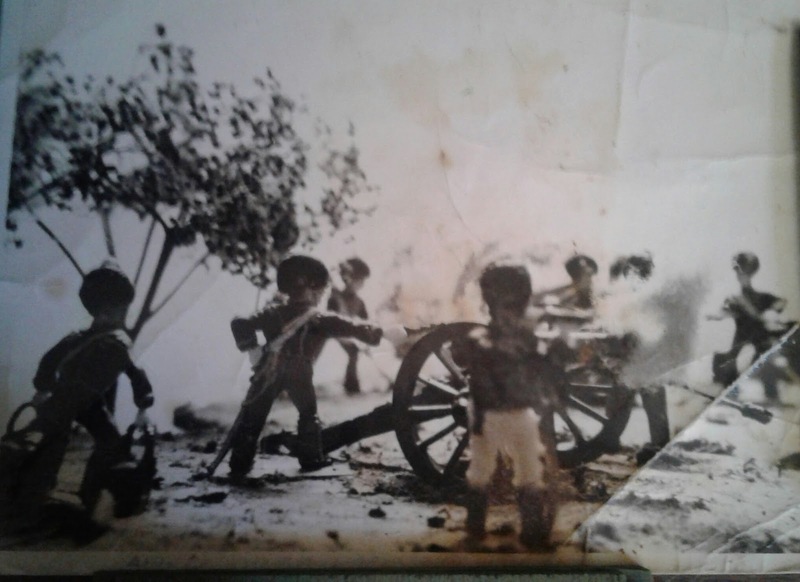 Luckily, veteran painters were now on hand and soon 6 people, 2 of whom had never before put brush to figure, had been pressed into service and coached and by the time pizza arrived a band of warlike Pathans was ready for action. 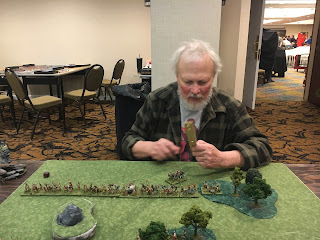 Not only did they look pretty good individually, they also looked cohesive and when put down on the table on Sunday morning they charged fiercely and broke a unit of Sepoys! We finished off the evening with a 4 person + GM, fantasy, person-to-person, arena sort of skirmish. This isn't usually my kind of thing but I sorted through the available characters and selected a Ranger who was reasonably fast and proficient with both bow and sword. I then did my best to persuade various Barbarians and Fighters that I was fast enough that if I didn't manage to turn them into pin cushions they might collapse from boredom and fatigue while trying to catch me and be easy prey for whoever else was left. Whether the threat of boredom worked or they felt sorry for me, the other 3 fought until just 1 badly wounded, exhausted barbarian was left to stagger towards me and a few arrows settled the question. Alas no pictures were taken. The convention itself started on Friday and Gary and I were there bright and early as was Rob who had driven up the 1,000 km from Maryland the day before. 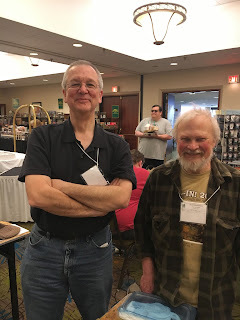 This gave Rob and I the chance to grab an empty table and go through a very small game to bring him up to speed on our Rough Wooing rules which I had, of course, tweaked since the last game some years ago. If we'd been familiar with the units and rules the cards could have been pulled off to the side but it was handy to have them with the units. 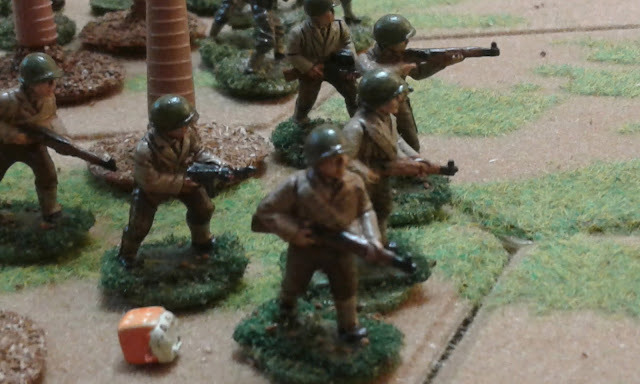 Luckily the 54mm figures were not lost amongst the clutter of stat cards and leader chits. We then took part in a 54mm "Very Civile Actions" ECW skirmish. In keeping with my experience throughout the weekend I found myself playing with a great group of people which was enough to render the game a pleasure to take part in. My character was mortally wounded while heroically leading the defence of a house blocking access to the critical crossroad which was a satisfying end. I rather suspect we were in trouble if the game had gone on much longer but perhaps not, in any event we were still holding after three hours and that had never seemed inevitable. And... no, I am not tempted to adopt the rules. They worked ok but not my style. What initially seemed like a climatic charge turned into a bit of a stand off as the troopers fired their pistols over the cannon at the pikes. Friday night Rob and I hosted our Rough Wooing game. The scenario was the same one I had soloed and had hosted at Kentville, just bigger with more figures. The test games had done their job and the scenario played out to a conclusion after a tight game. For those who missed those posts, the scenario was adapted from Stuart Asquith's Solo Wargaming. 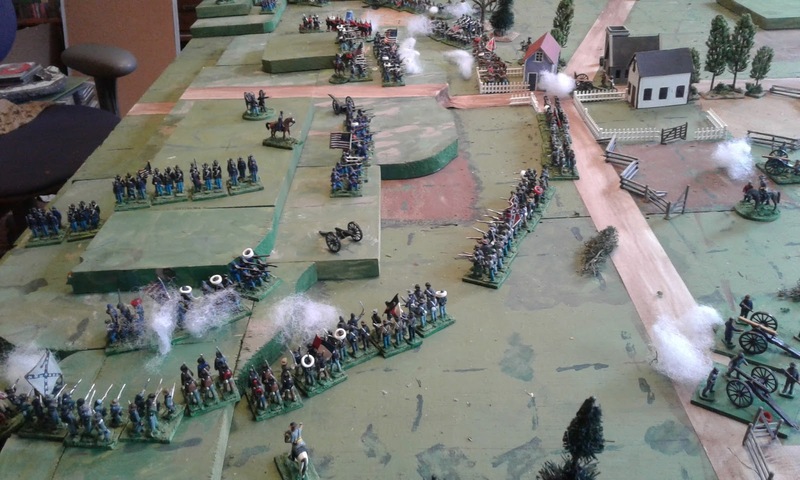 Two opposing forces have met at a road junction, both having orders to place a garrison in the town while exiting two Regiments off the far end of the table by road. 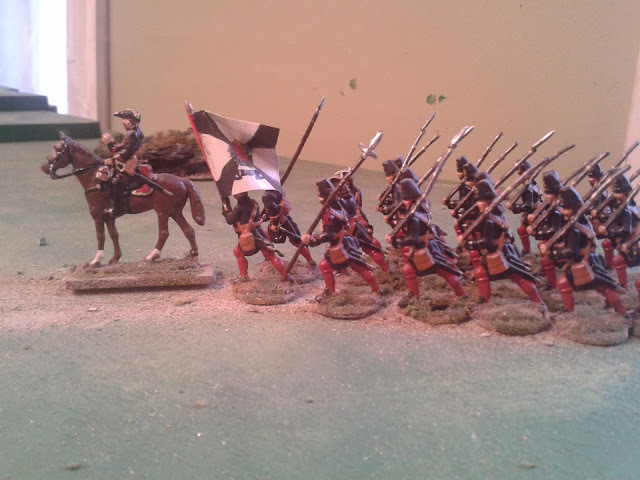 Ron provided all but one of the French units as well as a stand of English Demi-lancers from his suitably converted Meisterzinn homecasts while I provided the rest of the troops. The Advance Guard cavalry clash as the Landsknechts provided by the Emperor march on. The French had the better plan, or perhaps I should say, based purely on observation, the French had a plan. They sent their advance guard cavalry backed by a unit of pikes to slow the English, sent their light infantry to seize the town and sent the heavy cavalry and a second unit of pikes to bypass the fighting and get off. 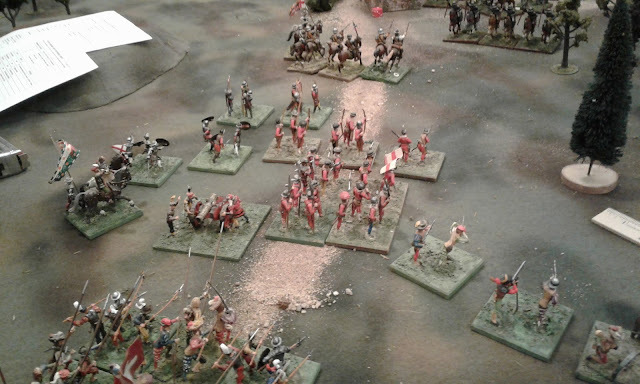 Alas the French nobles appeared reluctant to miss the fighting and consistently rolled as low as possible for movement distances and the pikemen had no room to go past them. The Englishmen and their German mercenaries threw themselves on the old foe and there was much heavy fighting with many casualties on both sides before the English remembered the victory conditions. An overview a little later. Just before I forgot to keep taking pictures. Midway through the game the opposing Imperial and French pikemen settled into a push of pike amidst a swirl of archers and arquebusiers on the fringe and the focus of players and spectators was inevitably drawn towards that point until both sides remembered that the outcome had minimal effect on victory. 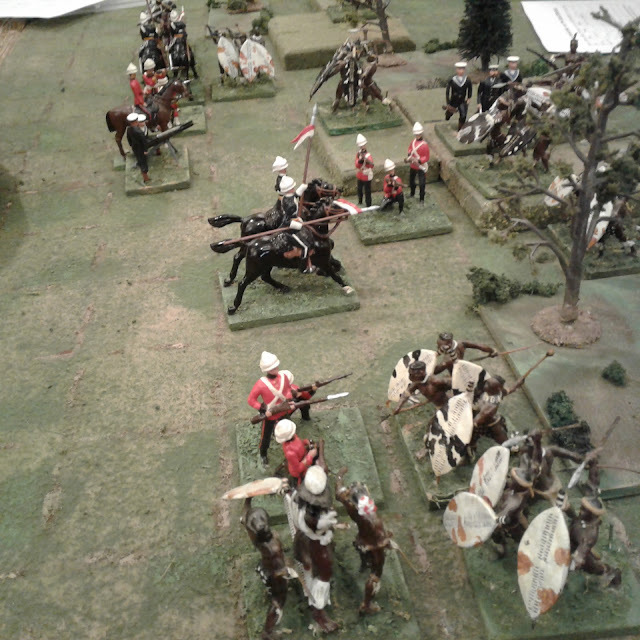 English billmen and archers stormed the town in bitter street fighting which wrecked both regiments. 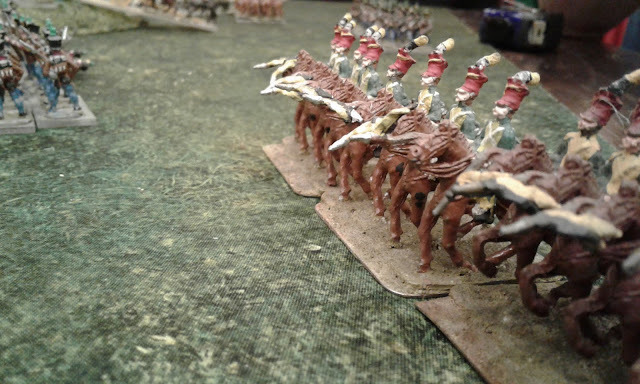 Behind the infantry both armies' remaining cavalry galloped towards the exit, or in the case of the French Gensdarmes slowly walked their horses while stopping to polish their armour, have a cup of wine.............. However, eventually the horsemen on both sides reached the decision point and in a confused series of melees where the French did some of the best and worst rolling of the game, the French cavalry was broken. That left the English with two regiments of not quite shaken cavalry ready to march off and while neither side held the town, the English still had 2 regiments in the fight including a fresh one against a single French unit and the French conceded rather than expend more whitemetal in hope of a draw. I'm not sure how I managed this split exposure but the bottom portion is close to right. The upper, or French, unit is one of Rob's. The rest are part of my motley crew. After that it was time for bed and oddly it is again. Part two will cover Saturday and Sunday. Well Huzzah 2017 is over. 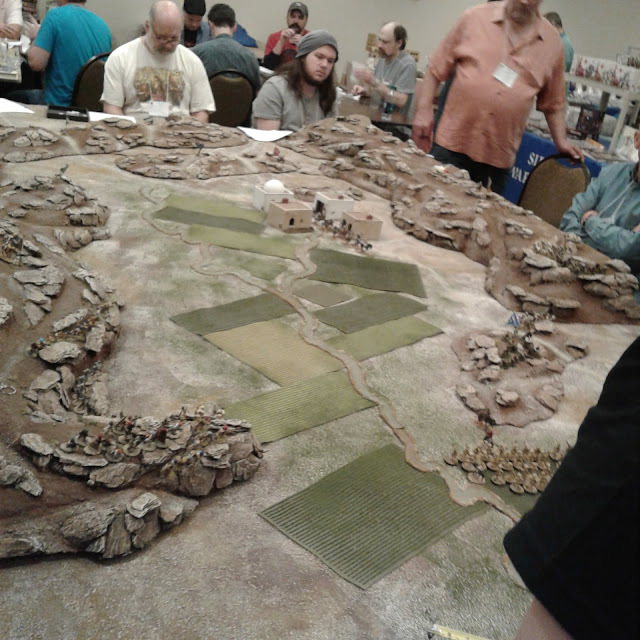 Once again a great event, well staged and hosted by the Maine Wargamers. Thanks to a combination of good health, good weather, good friends and good fellow gamers, one of the most enjoyable conventions for me in years which is saying a lot. 1 of 7 Portable Wargames played in 3 different periods and 2 scales. Tonight I am ensconced at my my sister's with hopes of getting home tomorrow. On Wednesday or Thursday I will hopefully write an illustrated report of the convention or at least what I can still remember of it! Pas de Charge and Hinton Hunt, from the Nafzinger collection. Day 1 is done. 1 game played and 1 GM'd. Both with a great bunch of gamers and both good games. Amazingly compactly packed and organized compared to my usual. A bit unsettling really. Its the usual May crunch, trying to get yard work and gardening done when the weather is good while trying to get everything ready and tested for Huzzah. So, thankfully a bit of sunshine did not equate to warm today so apart from a short, shivery, spell of pushing the roto tiller around one corner of the veggie patch I set up the Travelling Mat and deployed the newly rebased Red and Blue armies along with a few dual purpose Zulu War units and sat down to produce a Quick Reference sheet for the Portable Wargame. Luckily that was on my list for after the convention anyway. Rather than wade through a dozen of the latest trial versions and variations, I sat down and typed what came to mind, pushed a few stands around and then updated them as events in the game prompted me to remember various decisions made recently like once again banishing hit removal because it makes the game drag on, and returning once again to d6 group orders. Then I updated the QRS and played a game through to confirm that this was all on track with my post game thoughts after the last game. The new Quick Reference for the Square Brigadier (1870's) is now available here. On Monday the serious packing begins! A week and a Wake Up till Huzzah. It's time for some of those last minute things. Plastic Soldier Co Yankees painted by me for Ron a few years back. 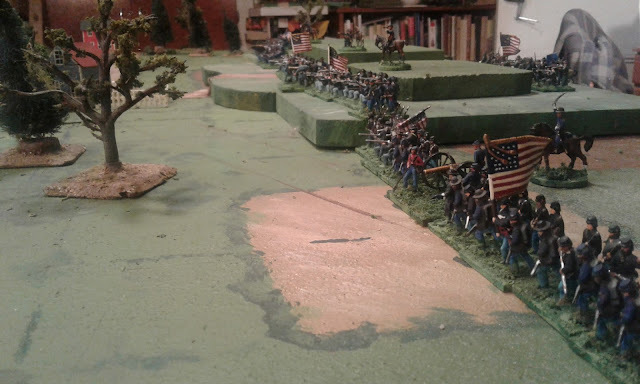 BUT, today I did finally start rebasing enough 54mm American Federal troops and a few Guards in Bearskins to allow for a Red vs Blue toy soldier option for my Portable Wargame 'walk up and try it' sessions at Huzzah. Should be able to try them out on the weekend before packing. My apologies to anyone expecting a thorough battle report. 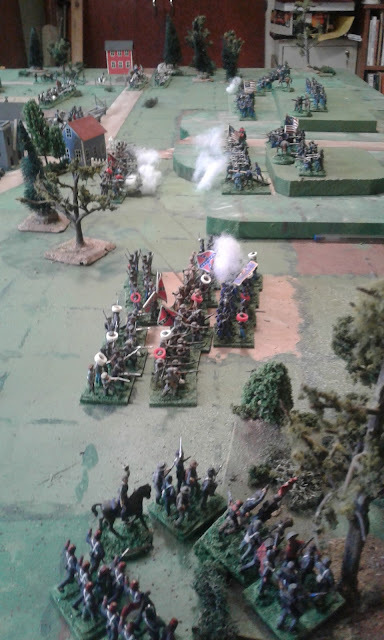 The game was as much about exploring rules for what is a relatively new style of wargaming for me as anything else and once the game was done my blogging time was mostly spent editing rules. Tomorrow I am off to Halifax for a visit and game with Ron so a hasty report it is! 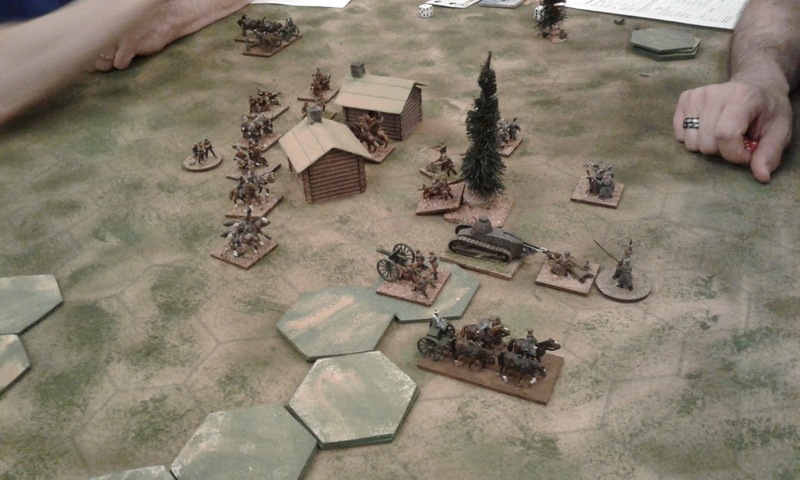 Featherstone's Division of Rebs hits the weak Yankee left flank. Mid game. 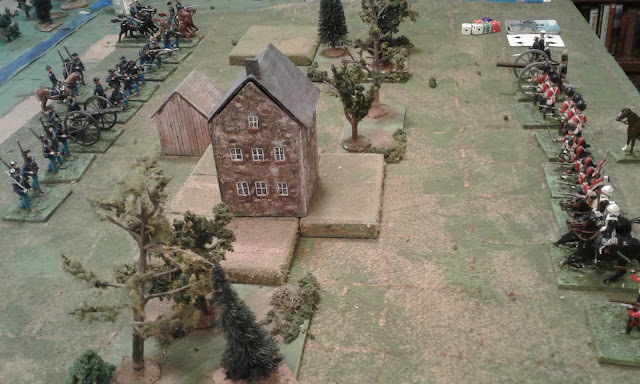 The Zouaves have arrived in the nick of time to shore up the centre but the Reb left wing has flanked the Yankee right and is pressing hard while the Yankee left is crumbling. 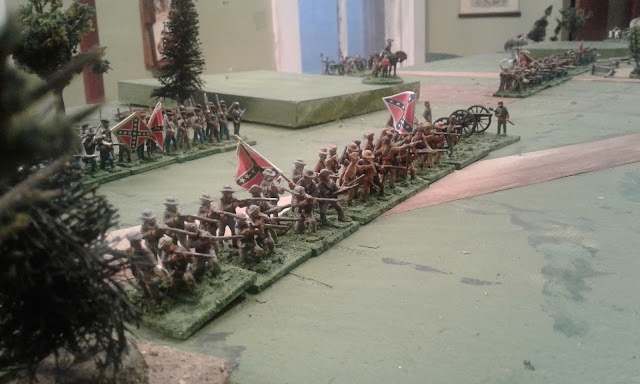 Having sorted through the painted and based figures I arranged a very slight numerical advantage for the Confederates. General Kinch's corp consisted of 3 divisions each of 3 brigades and 2 batteries. (More like 12 gun artillery battalions probably). The Federals defended a line of hills with 3 Divisions, 2 with 3 Brigades and a battery, 1 with 2 Brigades and a battery and a Corps artillery battery. Some units on both sides started off table by a random process. The basic flow of the battle is summarized in the pictures. The view from the other flank. I stopped once or twice to make changes to details or to the play sequence, partly to improve the flow and simplify/speed the game and partly to enforce letting go of inappropriately low detail. For example, the player is supposed to be the corps commander so limbering batteries should be someone else's concern and need not be shown, only the result. One of the advantages of going off grid was that I could fall back on an old, simple and highly effect method of introducing the effect of "friction", which is to say dice based movement. In this case a simple 2d6 roll read in inches for infantry and artillery with Commanders having the ability to join one unit per turn to boost it by adding another die. 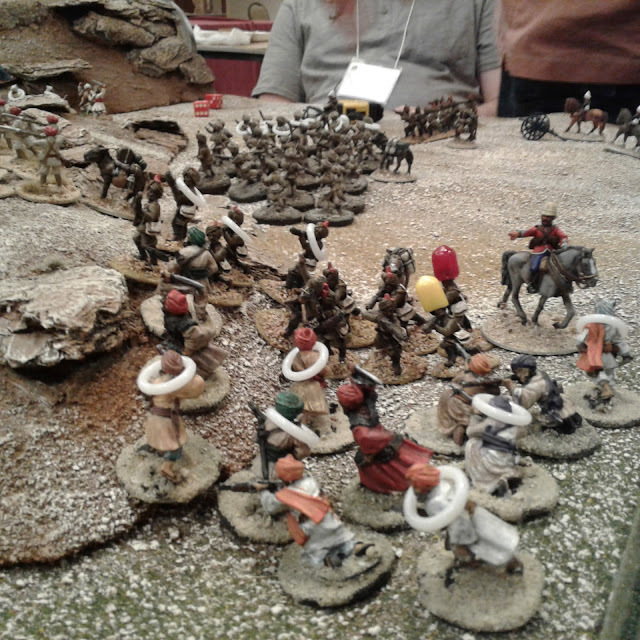 Nothing like riding madly to spur on a Brigade that rolled 3 on 2 dice only to roll a 1 for your boot. Oops perhaps more cool analysis next time and less yelling! At the moment the rules, which are available free here: Plastic Army of the Potomac, are a brief basic summary and by the time I flush them out and add in the extras, engineering, amphibious ops, supplies and hospitals and so on they'll probably end up about twice as long. They are in effect though its not necessarily obviousl, an re-imagining of Hearts of Tin at a higher level and borrowing many ideas from past versions. The end. The Federal left division routed two turns ago and now the centre has followed. The right is still holding but must retreat before it is surrounded and crushed. General Kinch has won the day. Time for bed. The ACW in 1/72nd will return. Having decided last year that I wanted to make some changes to my ACW games, I spent some pleasant hours today reviewing and tweaking organizations and rules. I also looked at several feet of shiny new fences and then put them away again to be assembled and painted another day. Featherstone's is the first Reb Division on the field. One of my conclusions was that my ACW games would be better game-wise if I had fewer but larger units. Initially I was thinking larger regiments but, after reviewing various options I decided to settle on brigades as units to make it easier to have larger wargame units and still fight small historical actions or significant pieces of big battles. This and my war of 1812 collection will be the only remaining periods where I can do that. The rest are all designed for petite guerre scenarios. 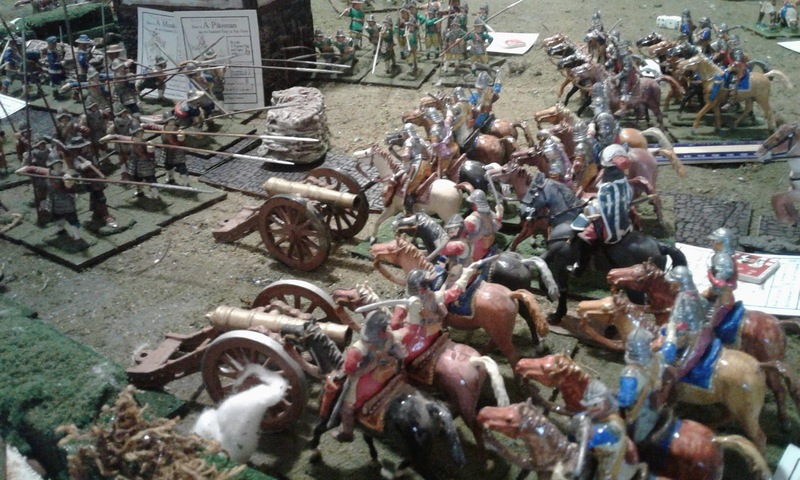 After several false starts I settled on standard brigades of 6 stands or around 1500 men. (36 figure brigades or very roughly 40:1.) That's a bit smaller than what I had in mind but it fits the existing figures, my goals and the table. The game below actually has a last minute tweak to rearrange the Union Divisions into a larger number of 4 stand Brigades but I think I'll undo that and use "standard" brigades on both sides until I'm happy that the new system will work. I can start adjusting to actual numbers later if I want though there are some advantages to standard units from a scenario design point of view. 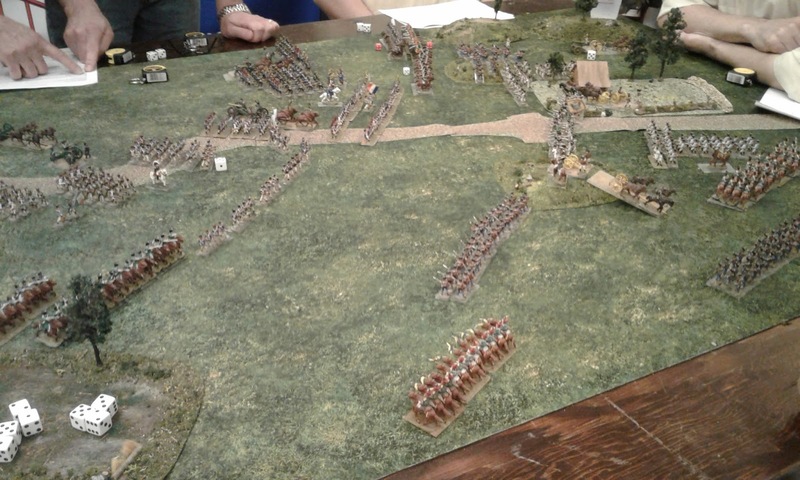 The scenario itself is just an adhoc attack/defence game with the Rebs having slightly more men. (VERY slightly). Basically, I threw out a hill line, put some woods in likely places, and did the same with some roads, divided up the available figures and then diced for how many brigades in each army are still marching to the table and how many are in each sector of the battlefield. The opposing Corps commanders can take it from there. It'll be a restless night in camp tonight. My older brother took this picture. Who knew he was old enough to have been at Waterloo? Or perhaps its photo of some of my Airfix figures taken in the early 70's? It all seems so long ago now That its hard to be precise about these things. Meanwhile, in the present, I should be getting ready for Huzzah, playing another solo Rough Wooing game or honing my Portable Wargame knowledge and scenarios but.......I need a break from all that. Once I get the table cleared I think I'll break out my 1/72 ACW "boys" and do something more traditional. Probably set up today and play tomorrow. Things have been busy here, just not much time or energy for wargaming and painting. Having a recurrence of a tooth abscess hasn't really helped much. 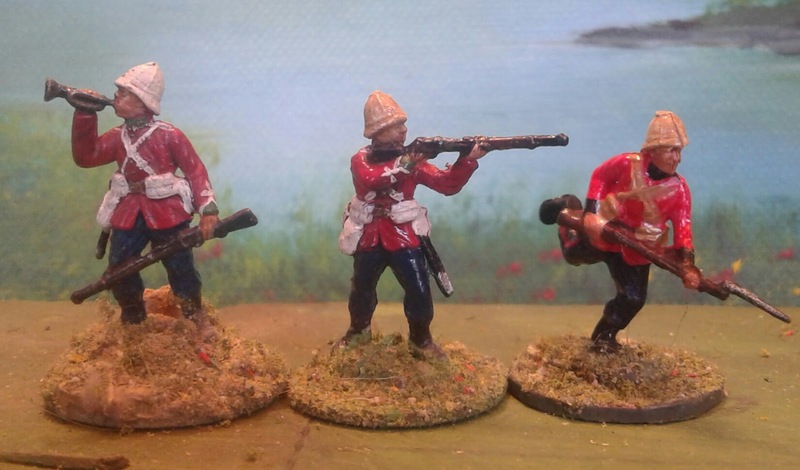 I have, however, managed to dab some paint on another dozen or so Esci Brits to bring my 1/72nd Boer War Brits up to 10 units for my Petite Portable Wargame demonstration for Huzzah. Were 1/72nd figures always so small? The 24th foot on the left were painted c1984. The 58th on the right was speed painted a few days a go. Luckily, without my glasses on, the most obvious difference is the lack of the bright white lace on the 58th's new service frocks. The lack of shading, sloppy belts and skipped details are less visible from three feet away in dim light with dim eyes. I have also noted that a few touch ups where painted flaked, a coat of varnish and 3 decades of weathering has obliterated most of the original shading so the old figures blend right in. Two Portable companies of Rifles and two of 58th Foot. I'm hoping for rain on the weekend so that I can maybe squeak a game in.